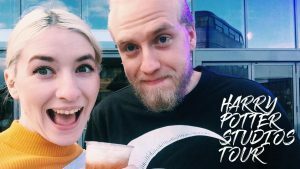 We Went to Harry Potter Studios! So over the past six months I thought I might get back into Youtube (and I warn you, I have NO clue what I’m doing) but I completely underestimated the time it takes to edit raw film. Omg so many scenes of me waffling, shaking the camera and swearing has lead to me putting off editing a lot of my vids for months- oops, *slaps hand*. So even though I went to the Warner Bros. Studios in London back in November, I really wanted to share my day with you here, in this wee vlog. We went for Kayle’s birthday and it was a fabulous time filled with banter, butterbeer and plenty of HP thrills. Olivia you babe! I really hope you go, its a fabulous place 🙂 Thank you so much for watching lovely!